Monarch butterfly on mulberry leaf. Butterflies and birds are all in migration now, and the ones you see at your feeders and in your yard are likely not the ones you saw all summer. The same species of birds move farther south from their summer ranges, from Canada to the Northeast and Mid-Atlantic U.S., for instance, or from Pennsylvania to Florida, making it seem as if the same birds visit your feeders all year long. And now is an especially important time to keep feeders and birdbaths filled for birds and butterflies who need to make a quick stop for nourishment before they move on. I have a few decorative additions to my garden and birdbaths for butterflies that hold a small amount of water in a shallow cup, a small luncheon plate on a tree stump that holds a small amount of water and I also keep a flat rock in the middle of a birdbath, all safe and convenient landing spots for butterflies to stop and have a sip. This entry was posted on September 2, 2012 by Bernadette. 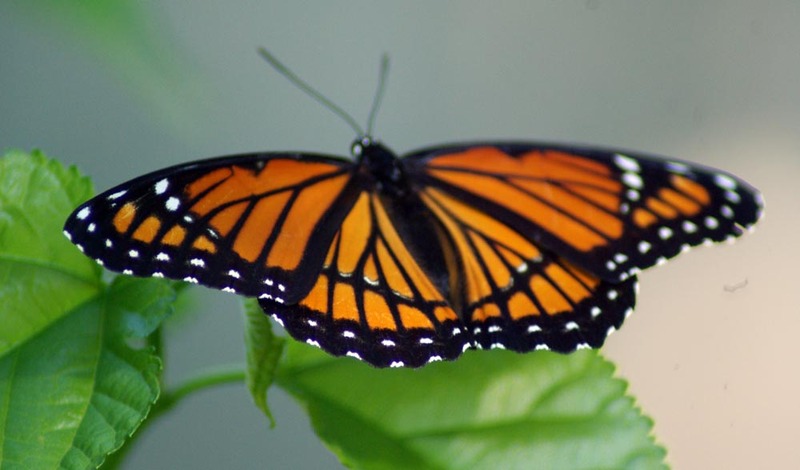 It was filed under animals, backyard, birds, butterfly, garden, milkweed, monarch, summer and was tagged with backyard, butterflies, fall migration, migrating birds, migration, migratory butterflies, monarch butterfly, nature, photography, summer.